Collects THE UNBEATABLE SQUIRREL GIRL #5-8, and material from GLX-MAS SPECIAL, THING (2006) #8 and AGE OF HEROES #3. The breakout character of 2015 continues her one-woman crusade against injustice, criminals and jerks! Squirrel Girl meets potential new allies including Chipmunk Hunk, Koi Boi and…Girl Squirrel?! Yes! But the two rodent-themed heroines don’t quite see eye to beady eye - and Squirrel Girl’s dislike might be justified! Now, as the world goes mad and the Avengers attack, Squirrel Girl must face Ratatoskr, the Norse God of Squirrels! There’s a theme in this book, I don’t know if you can tell. The fate of the world hangs in the balance, though, we promise. Featuring fights! Feelings! Sass! Punches! Friendship! A character named Hippo who is literally a hippo! 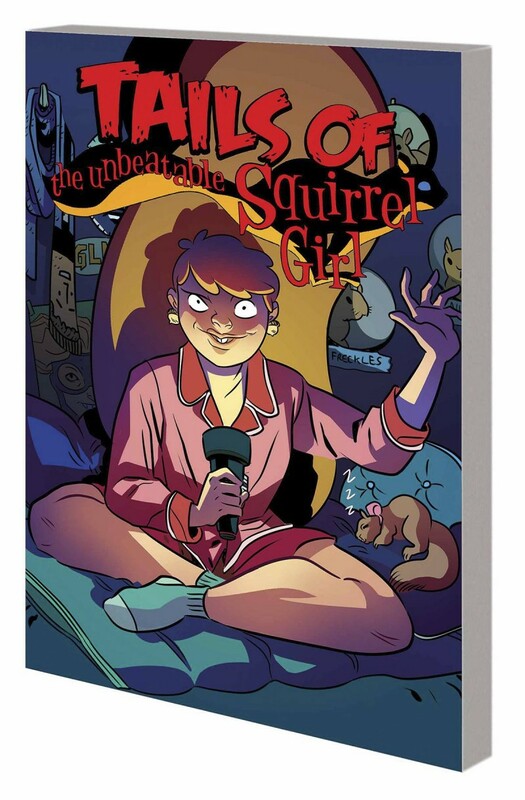 And several tails (tales) of Squirrel Girl from all kinds of perspectives!